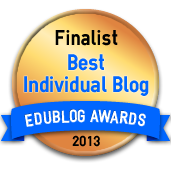 I’m very pleased to report that Speech Adventures has been nominated for an EduBlog award. Not only was it nominated, but is on the short-list of nominations…which means it’s time to vote. I am incredibly honored to be included in this list. Thank you! If you find Speech-Adventures helpful, I’d love to have you vote for it. As with any vote – while I would love to have you vote for me… it’s more important that you vote…for anyone. Your vote helps recognize the work that goes into creating a blog that’s worth reading. So… go vote… for anyone (even if it’s not me!). Voting closes on December 9th. Vote daily…Until then…Adventure on!